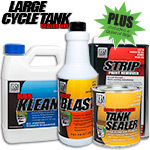 Which Tank Sealer Kit or How Much Do I Need? 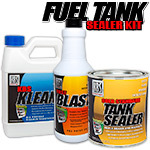 Use this Guide to help determine which Tank Sealer Kit you should order or how much KBS Klean, RustBlast and Gold Standard Tank Sealer you should order. 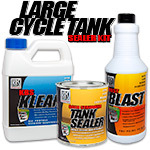 This Guide is for most tanks including Gas Tanks, Diesel Tanks, Fiberglass Tanks, Tractor Gas Tanks, Oil Tanks, Utility Tanks and Non-potable Water Tanks.. Gold Standard may be used on steel, aluminum, and fiberglass tanks. Please keep in mind that these are just guidelines. 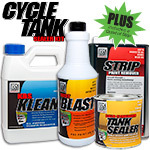 Coverage will vary based on application, condition of tank, substrate of tank, and other factors. help you order the correct quantity.